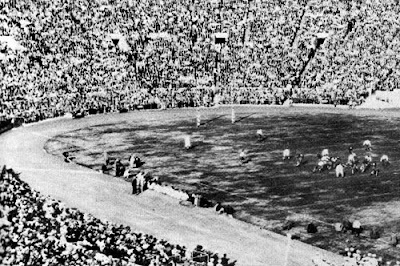 The 1927 Rose Bowl set an attendance record of 57,417. While the 1926 Rose Bowl and subsequent National Championship brought unprecedented nationwide attention to Alabama football program, the season that followed was the opportunity to cement the program’s success. To achieve that Coach Wallace Wade faced a difficult challenge. Gone were Alabama’s marquee names of "Pooley" Hubert and Johnny Mack Brown as well as a host of key playmakers. Yet Wade was convinced the team still had enough of talent and determination to make it back to Pasadena. With disciplined play Alabama continued to be an immovable object on defense. 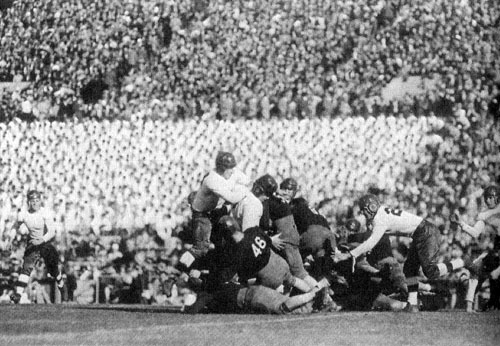 The Crimson Tide outscored opponents 242-20 during the 1926 regular season, allowing just three touchdowns. The closest game was an Oct. 23 matchup against the Tigers of Sewanee that was decided by a safety in the waning minutes of the contest. The victory ensured Alabama would retain the Southern Conference crown and an invitation to the Rose Bowl to face the Pacific Coast Conference champion, Stanford. As he had the year before, Wade insisted his players were to stay focused on the game and he made sure to provide plenty of practices to ensure they would. The team completed the 2,000-mile train journey to California on Christmas morning and Wade had them on the practice field that afternoon. The Crimson Tide had arrived in Pasadena the defending national champions riding a 20-game win streak and they were ready to play. Their opponent wasn't cowed in the least. In the 1920s, Stanford was coached by Glenn Scobey Warner, better known by his nickname "Pop." Warner was a legendary figure due to his success at Georgia, Cornell, Pittsburgh and Carlisle Indian Industrial School where he coached Jim Thorpe. Warner had revolutionized football with his innovative strategies. One of which, the single wing, had become a standard of Wade’s dynamic offensive attack. Hired by the Cardinal in 1924, Warner quickly built the team into a West Coast football power. He led Stanford to a 6-1 season and the Pacific Coast Conference championship. A Rose Bowl invitation followed matching the Cardinal against Knute Rockne and the famed Four Horsemen of Notre Dame. While Warner's team dominated the Fighting Irish for most of the contest, Notre Dame capitalized on three Stanford turnovers to win it 27-10. Two seasons later Stanford amassed a 9-0 record, another conference crown and an invitation to spend New Year’s Day in Pasadena. On Jan. 1, 1927, a record Rose Bowl crowd of 57,417 showed up on a sunny and hot afternoon to see the showdown of the last undefeated and untied teams in the country. The United Press called it "the football championship of America" and demand for tickets was so great organizers had added extra stands to boost the stadium’s capacity by 4,000 seats. The game also boasted a national audience as NBC made it the first coast-to-coast radio broadcast with famed sports broadcaster Graham McNamee calling the play-by-play. Stanford wasted no time trying to get the upper hand. On the Card’s first play from scrimmage the teams fullback and primary passer, Clifford Hoffman, threw a 40-yard pass to end Ted Shipkey. First down on the Alabama 27-yard line. The Crimson Tide defense stepped up and forced Stanford’s George Bogue to try an 18-yard field goal. The kick went wide and Alabama took over on downs. Yet, three unsuccessful running plays later the Crimson Tide was forced to punt. Then things got a little crazy. Stanford’s William Hyland caught the ball but before he could return it he was hit Alabama’s Fred Pickhard. Hyland fumbled the ball and Alabama’s Herschel Caldwell scooped it up… only to fumble it himself. Shipkey finally fell on it giving the Card’s possession and starting their drive again. It wasn't until late in the quarter that Stanford completed a 63-yard drive with a five-yard-pass from Bogue to Ed Walker who scrambled the remaining yard into the end zone. A successful extra point kick by Bogue made it 7-0 Stanford. The second and third quarters produced a scoreless defensive struggle. It wasn't until well into the final period that either team had a real chance to score. Late in the fourth quarter Stanford was forced to punt from their own 42-yard-line and Alabama’s Baba Pearce blocked the kick. The Crimson Tide recovered the ball at the Card’s 14. Knowing he'd need fresh legs to run the ball, Wade sent in running back Jimmy Johnson who had not played all afternoon due to a dislocated shoulder. On the first play of the drive, Hoyt "Wu" Winslett carried the ball three yards. Johnson then got the ball and ground out four more. Two more carries by Winslett got the ball to the Stanford one-yard-line and Johnson made the final carry into the end zone for the score. Wade was taking no chances on getting the extra point and relied on a bit of deception to make sure the kick went good. As Alabama got set for the play, running back and signal caller Emile Barnes stood up and yelled "Signals off!" Stanford’s players took this to mean Alabama was going to reset for the play and relaxed for a moment. Instead, Crimson Tide center Gordon "Sherlock" Holmes snapped the ball, Winslett placed it on the ground and kicker Herschel Caldwell put it through the uprights to tie the game at 7-7. On the following possession, Stanford started at their own 22-yard-line but only had time to get off two plays. With no overtime the final score stood 7-7. The game would be the final Rose Bowl to conclude with a tie and the outcome resulted in Alabama and Stanford sharing the National Champion title. Stanford returned to Pasadena the next year to face the University of Pittsburgh. The Cardinal edged the Panthers 7-6 to give Warner his only Rose Bowl victory. Although Alabama would not return to the Rose Bowl for another four years, the two successive New Year’s Day contests had cemented the program’s future. 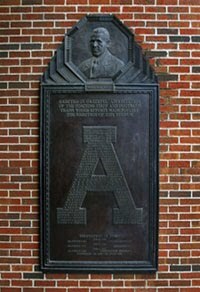 The Crimson Tide was now a household name across the country and that brought greater attention to both the football team and the university itself. In addition, the proceeds from the two Rose Bowl games helped pay the $150,000 cost to construct Alabama’s own football stadium. On Sept. 28, 1929 the school opened the 12,000-seat Denny Stadium – named for the University’s president George Hutchenson Denny. Perhaps the most important impact of the 1927 Rose Bowl for Alabama’s football program went completely unnoticed at the time. In rural Arkansas, a 13-year-old boy listened to the historic broadcast of the game on the radio and heard the siren call of his destiny. "I never imagined anything could be that exciting," recalled Paul W. Bryant years later. "I still didn’t have much of an idea what football was, but after listening to that game, I had it in my mind I wanted to go Alabama and play in the Rose Bowl."